Want to fill your kids’ Easter baskets up with something other than sugar-loaded chocolate and candy? Then, you must check out these fun and healthy spring recipes! Spring is tricky when you’re trying to eat better and raise healthy eaters. It’s strange, really. We start the year off with grand resolutions to stick to a healthier diet, cut out fat and sugar, and generally maintain a better overall lifestyle. Then February happens, and out come the chocolate hearts, chocolate dipped strawberries, and ginormous boxes of chocolate-covered everything. Name any food and February will find a way to smother it in chocolate. If you think you’ll get a reprieve once March rolls around, think again! Chocolate is joined by its gooey friend, the marshmallow, and the whole cycle starts over. This time, though, your kids become the target audience. Commercials featuring clucking bunnies and dancing marshmallows bombard our kids and send them begging for the one thing we’re really trying to cut out of their diets: junk food. Here’s the good news: if you think outside the box of chocolates and get creative with healthy foods, your kids won’t miss all the junk! 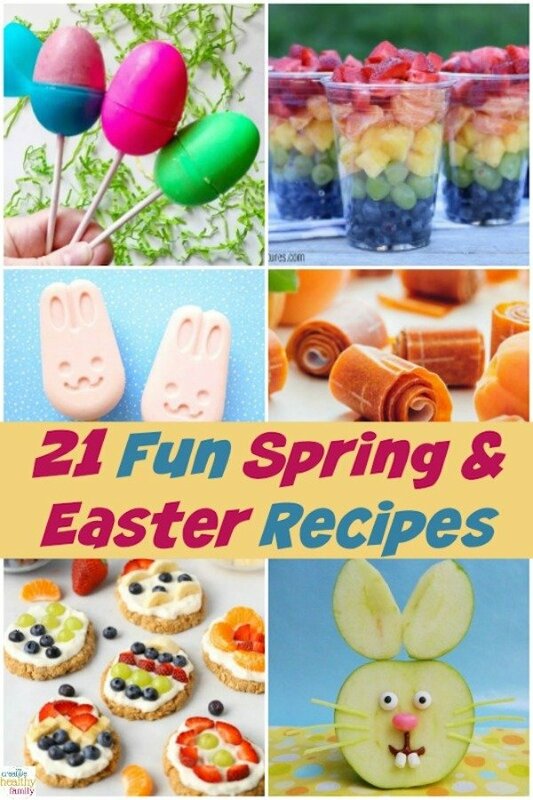 Check out these 21 fun spring & Easter recipes, then read on for a few tips on turning the ordinary into extraordinary for your family. The #1 way to get kids to actually eat that fun healthy recipe you want them to try: get them involved in making it. Kids as young as 2 can help hand you the ingredients, while older kids can mix & stir, arrange creative patterns and more. Cookie cutters turn boring sandwiches and other healthier offerings into irresistible goodies in no time at all. Grab some bunny and chick shapes for spring! You can also get an oval-shaped cutter and use healthy condiments and veggies to “decorate” an Easter egg sandwich! For foods that don’t work with cookie cutters, break out the kabob sticks. Alternate tomatoes, cucumbers, and carrots for a colorful “salad on a stick,” or make a “sandwich on a stick” out of cold leftover chicken cut into cubes, chunks of cheese, tomatoes, and folded-up slices of whole wheat pita bread. For younger kids, grab blunt-ended kabob skewers or cut off the sharp tip before serving. Print out some fun spring shapes, like tulips, bunnies, or chicks. Coloring pages also work. Stick the page under a clear (and clean, obviously) placemat or a clear party plate, then cover the design with healthy foods like fruits, veggies, or anything else you really want your kids to eat. Tell them there’s a secret surprise hiding underneath, and they have to eat all of their lunch to uncover it. Try these tips along with the fun spring recipes above and your kids will never even miss the chocolate-covered marshmallow madness this Easter! 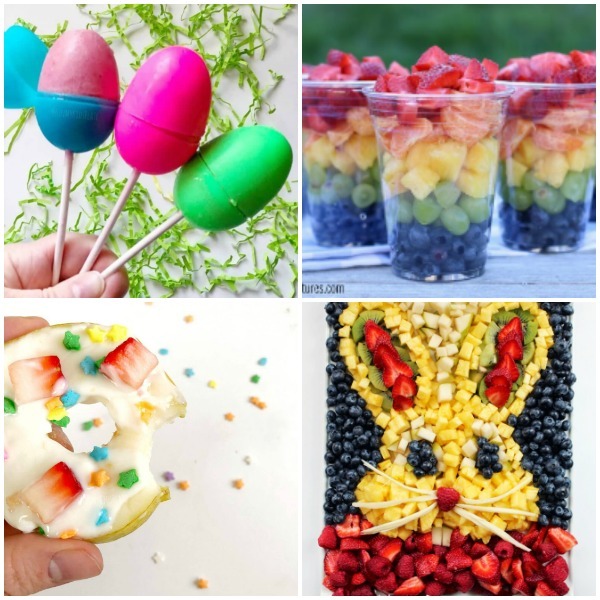 You can even use some of these fun food ideas as basket fillers!